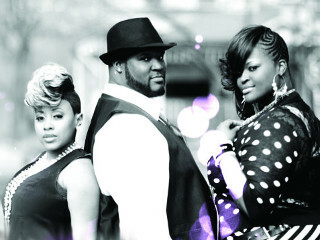 Soul Purpose is a local vocal trio specializing in smooth vocals and intricate harmonies. They've been singing together since high school. They all attended Lawrence North High School. They recently signed to Owl Music Group under the direction of the legendary Kenny Phelps. They've opened up for Earnest Pugh, Kierra Sheard, sang backs for Josh Kaufman, Jessica Reedy, George Benson, Cynthia Lane, Tad Robinson,Max Allen, Sarah Scarborough, etc. On Saturday April 4th they'll open up for Michel'le at the Anthenaeum Theatre downtown Indy. On March 12 they will be featured at the Gospel Meets Jazz concert located at Latitude 39 sponsored by Owl Music Group. There they will be featured as artists, and join an all star cast of Indy legends as Owl Music Group pays tribute to the late great Cynthia Lane. Though well known in the Gospel world of Indy, they're making themselves known in the Jazz world here in Indy too. They have an album called Soul Purpose:For You, also 3 Christmas singles, Christmas Time Is Here, Carol of the Bells, and Little Drummer Boy all of which can be found on iTunes and Amazon Music. They're grateful to God for their gifts, and look forward to what the future has in store.